Gum recession can result when a patient has gum disease (periodontitis). The causes, treatments and outcomes are different from what is involved when gum recession occurs as a result of the patient having "thin, fragile gum tissues". Periodontitis is a more aggressive disease and can destroy not only the gum tissues, but also the underlying bone which supports the teeth. The result of untreated periodontitis is the loss of some or all of your teeth. Even though "gum recession" may have been what caught your attention, this page will discuss what you need to know about periodontitis since this gum infection may have caused your recession and will affect all of your teeth, not just the one(s) with recession. 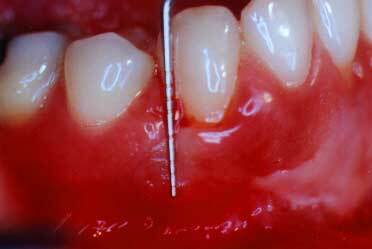 Gum recession between the teeth and redness indicate periodontitis. Gum disease (periodontitis) is a problem where many people simply are not aware that it is present. That is why it is frequently described as a "sneaky" disease. While we can explain some of the signs which tell you if you have gum disease, you can still have gum disease even if you aren't aware of any of its signs. However, it you are seeing gum recession that is different from Gum Recession: Thin, Fragile Tissues, then you must have your gums examined by a periodontist for the presence of periodontitis. 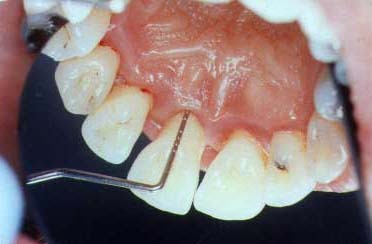 If you notice that you have recession, the cause may not be from the lack of thick tissue, but rather from periodontitis. If the recession is only on the front side of a tooth (lip side), this recession could be from the lack of thick tissue or from periodontitis. If you notice that you have a space between two or more teeth that was not there before, that is usually a sign that gum disease is present. Another consideration is that if you see a space between the teeth that was not there before, the gums may have receded or the teeth might have moved apart (called "migrating"). If two adjacent teeth which formerly contacted each other, and now no longer touch as they previously did, the appearance of gum recession or a "space" is related to this "migration" or seperation of the teeth. If your gums are bleeding when you brush them, you definitely have gum disease --even if the bleeding is not at the sight of the recession. Patients who have gum recession have a tendency to avoid brushing where the gums meet the teeth -- incorrectly thinking that protects the gums. Since many people do not brush where the gums meet the teeth, they may not have any evidence of bleeding gums, even though gum disease is present. This is why the absence of bleeding gums does not mean there is no gum disease present, while the presence of bleeding always means that gum disease is present. Bad breath can be a sign of gum disease or it can be present if there is no gum disease. Bad breath can be caused by certain foods, the lack of proper cleaning of the teeth even with no gum disease, the build-up of bacteria on the tongue or even from stomach problems. However, if bad breath does not go away after brushing and flossing properly, including brushing the tongue, you must consider that there may be serious gum disease where the pus and bleeding from the disease are contributing to the bad breath problem. The normal gum color is usually described as "coral pink". If you see that your gums are red in color, you should be suspicious that gum disease is present. 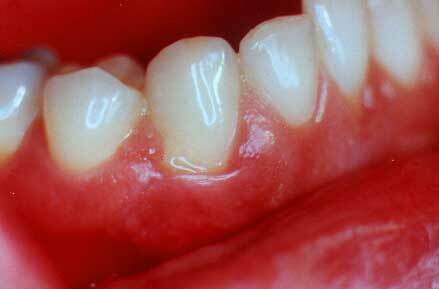 Reddened gums may not always bleed. However, if you have red gums, especially shiny red gums, and even if they don't bleed upon brushing them, you should see a periodontist. If you are a "mouthbreather" this can contribute to the appearance of red gums and then gum infection. 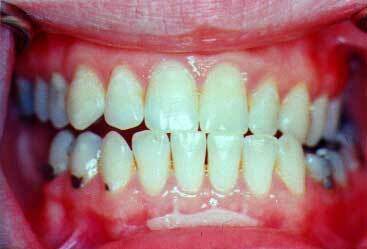 If you are aware of looseness of some teeth, this is a very clear sign that advanced gum disease may be present. When the patient is aware of looseness, that is usually a very bad sign since patients don't perceive looseness until the teeth are very loose and sometimes hopeless. Gum disease is caused by the bacteria that are normally in the mouth. The types of bacteria may vary with some patients having more types of bacteria that are associated with aggressive gum disease. 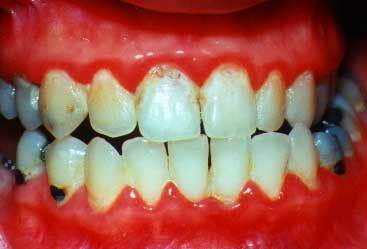 The bacteria then accumulate where the gums meet the teeth. The gums normally form a "ditch" or "sulcus" that goes completely around the tooth like a "cuff on a shirt goes around your wrist". 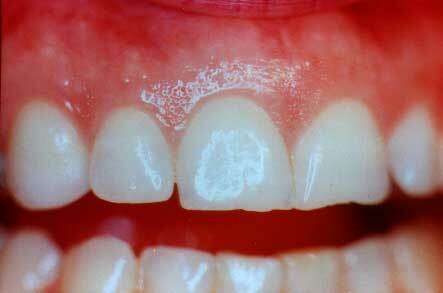 Once the bacteria cause the gums to become infected, the gums detach from the teeth. When the gums are healthy, the normal depth of the "sulcus" is 1-3 millimeters. When the gums detach from the teeth as a result of the gum disease, a diseased "sulcus" is called a "pocket" and the "pocket" has a depth deper than the 3 millimeters of the "sulcus". This deeper depth of the "pocket" then prevents the patient from treating their own gum disease since a patient can not clean into a"pocket" and eliminate the excess bacteria when the pocket depth is deeper than 3 millimeters. The untreatable (by the patient) gum disease then spreads into the underlying bone which supports the teeth. This causes loosening of the teeth. 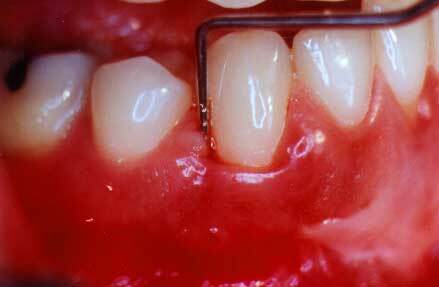 If the gum disease is not treated early enough, the patient will lose their teeth. Smoking has been shown to increase the chances of getting gum disease and also of having more aggressive types of gum disease. Patients who have diabetes or who have diabetes in their family can be predisposed to having gum disease or to having a more aggressive type of gum disease. If a patient has poorly-controlled diabetes, this may be associated with a more involved type of gum disease. There are genetic considerations which predispose patients toward a more aggressive, severe type of periodontitis. Patients who have a family history of tooth loss or parents wearing dentures, should be more concerned about a genetic resistance consideration. It is not known why some patients naturally have bacteria present in their mouths which are not associated with aggressive periodontitis while other patients have the more aggressive type of bacteria. ** Important: It has been shown tht patients can transmit gum disease bacteria to their spouses, and that when the spouses have gum disease, the other spouse is more likely to have gum disease. If you are shown to have a more serious type of gum disease, it is important to check the gum health of your spouse. 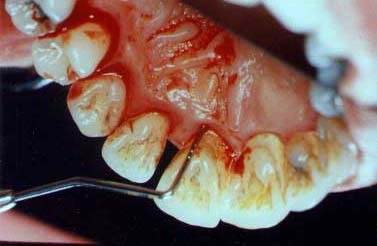 Check the website www.periotrans.com for more information about gum disease transmissibility. b. What is the appearance of gum disease? Please remember from 2. The Cause of Gum Disease, when the gums are infected, they detach from the teeth and form the probing depths that are deeper than 3 millimeters. The following case types will show probing being done and you will see the silver periodontal probbe. Healthy gums look healthy and probing into the "ditch" or "sulcus" only goes to a depth of 1-3 millimeters. 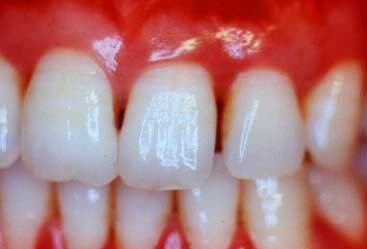 Disease gums show changes in color, form and texture, and also show a probing depth deeper than 3 millimeters. You can see the "coral pink" color, the form where the gums fit into a nice sharp tapered point between the teeth and where the "stippling" exists. This print shows the probe outside of the gum "sulcus" in order to show just how deep it would have gone (2-3 mm) in this healthy "sulcus"
Periodontitis (gum disease) looks different in different patient's mouths. However, changes in color, form and texture are good visual clues to look for when you are looking for the presence of gum disease.These next photos will show how a deep pocket may actually appear. The gum tissue is slightly redder than normal and there are slight changes in the gum tissue form. There is some yellow pus on the gum margin where the periodontal probe will be inserted in the next photo. pocket to a depth of 8 mm. Non-surgical therapy is called root planing. Root planing is where the gum tissues are usually anesthetized with a novocaine anesthetic and the dentist or hygienist will scrape the diseased tooth root until it is clean and no longer contains bacterial waste products. Root planing may sometimes be enhanced with antibiotics that are taken orally or placed into the gum "pockets". Not all cases of gum disease will have antibiotic enhancements as a part of their root planing therapy. After root planing, the gum tissues are usually tender or sore, but not usually painful. When the periodontist determines the gum disease aggressiveness, the periodontist can determine the modifications in the root planing treatments that best fit your case. Here you can see the silver periodontal probe which goes 5 mm. into the pocket.There is much bleeding and infection present. The gum tissues are pink in color and there has been some tissue shrinkage. 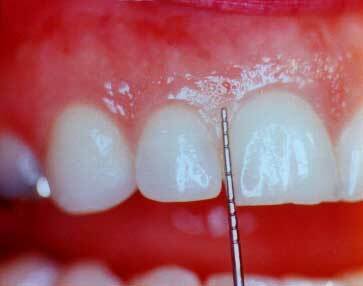 The gums are healthier with a probing depth of 3 mm. Gum surgery is done to eliminate disease pockets which still exist after all healing has been achieved following root planing. There are, however, a small number of cases which will not benefit from non-surgical root planing and surgery will be recommended without having root planing done. Surgery is most frequently done with a novocaine local anesthetic. A periodontal dressing may be placed after the surgery in order to protect the tissues. There may be some pain after periodontal surgery. This view shows very inflamed gums where periodontal surgery will be needed in order to save her teeth. The gums now are pink and healthy. She can now maintain her teeth for all of her life.